A Miracle of Science: It's times like this I'm glad I have my evil duplicates to protect me. MoS reader Simon Heath wrote in and asked several cogent questions about the terraforming of Venus. Since the story has brought us back to Venus, I figure this is a good time to indulge in another of my infamous science lessons! 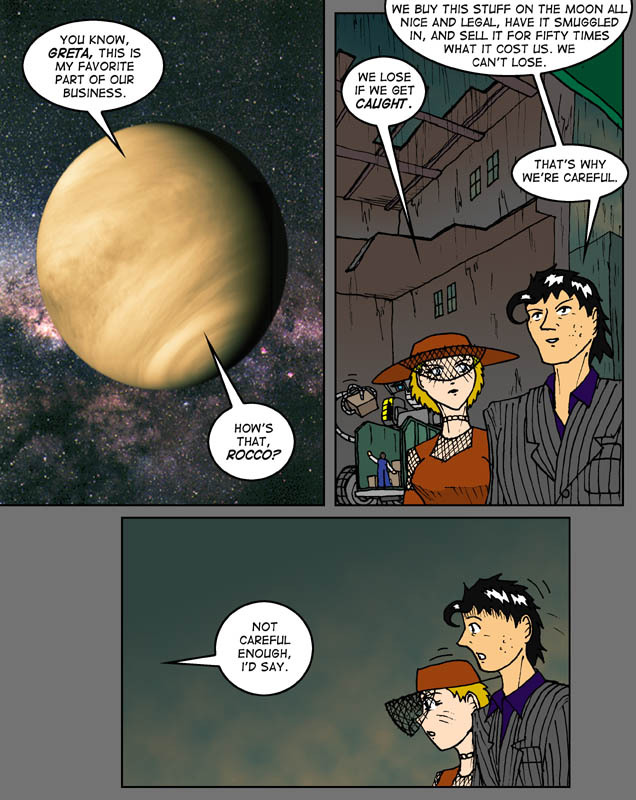 The terraforming of Venus is actually important to the story, although its importance hides in the background (which is where backstory belongs, after all). 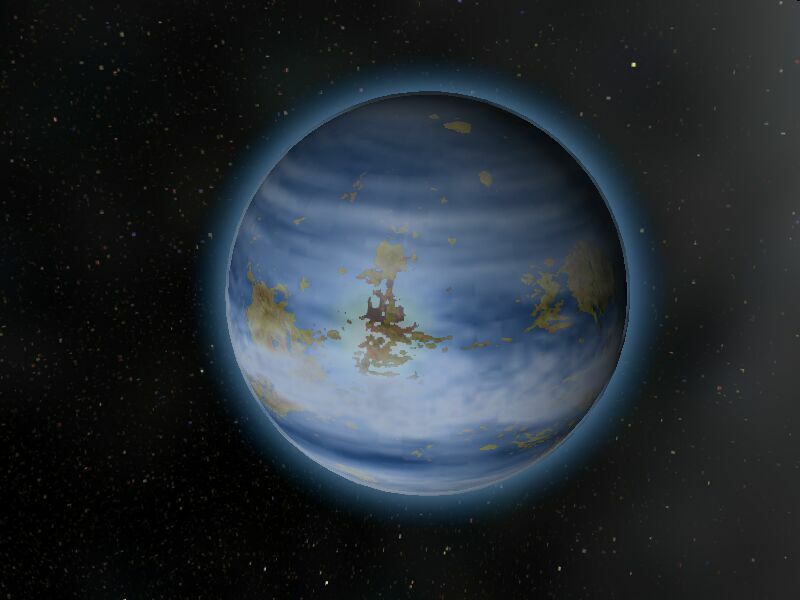 The older cities on Venus in MoS tend to be on cliffs high above the ocean, or on rivers upstream of the tidal bore, since the terraforming process washed atmospheric carbon dioxide and sulfur into the newly-created seas, making them acidic. Over the course of a few decades, Martian technology locked the carbon dioxide away in limestone and the sulfur in sulfide rocks like barite and gypsum. The ecological disaster that was Venus just after its terraforming, before the carbon and sulfur were locked away, led to a system of careful safety controls on the populace - which by the time of our story has devolved into a stifling dictatorship. There are greater difficulties in terraforming Venus than just its atmosphere, however. Reducing Venus' atmosphere is almost trivial in comparison to the greatest hurdle - getting Venus to revolve faster. Currently, Venus' day is over two hundred Earth days long - and the planet rotates retrograde ("backwards"). The amount of energy required to change Venus' rotation is literally astronomical. Also, one would need to insert that rotational energy into Venus without tearing the planet apart or turning its surface into a cauldron of molten lava. Fortunately, I can explain this by falling back on the existence of transcendentally advanced Martian technology - and I can make an authorial decision to not mention it. Um, oops! P.S. Oh! Mysterious offscreen new character enter! Who is it?!? Way back when we were still planning out MoS, following in the footsteps of The Evil Dr. Ganymede I used my old Solar System Demo to create this rendering of what Venus might look like post-terraforming. For the sake of keeping the look of the comic consistent I decided to stick with the planet's traditional appearance when it came to actual production, but still, the render came out rather nice I'd say. I don't think I've linked to any other comics in a little while, so dig this: Indavo, true old-school space adventure with aliens, robots, pirates, space battles, attractive women wearing revealing outfits, major property damage, and even a Time Traveller In A Big Hat! This strip also gains many points from me for its fast-moving story and admirable on-time record. Basically, if you like things that are cool, I recommend you check Indavo out.